KL SOGO, is an organization very much involved in reaching out to the community especially in organizing many yearly CSR projects beneficial to the community and also bringing awareness to the public for each of their causes every year. It has always been KL Sogo priority to serve the community better and help to tackle community issues that are happening around. This year, KL SOGO has embarked on yet another Corporate Social Responsibility (CSR) Project, to raise awareness among the public about domestic violence against women and also to form core groups in every state to continue with this advocacy work. The ‘Nationwide Campaign Against Domestic Violence’ was officially launched on the 13th of June 2013 at KL SOGO. 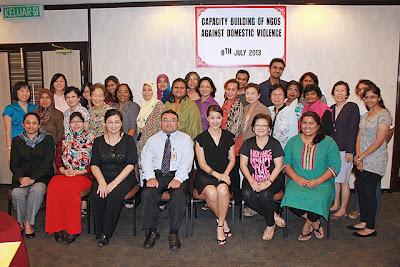 The ‘Nationwide Campaign Against Domestic Violence’ was initiated by Carol Lee (Mrs Malaysia Universe 2013) and is fully funded by KL SOGO and organized by the All Women’s Action Society (AWAM). The main objectives of this campaign are to raise awareness on the issues of domestic violence, to promote and encourage volunteers to join the force as advocates and trainers, as well as to form core groups to maintain and continue the advocacy work throughout the country. The campaign will run for approximately 1 year, starting from July 2013. Phase 1 will include Kuala Lumpur, Perlis, Penang, Kedah, Johor, Kelantan, Terengganu, Pahang, Perak, Melaka, Negeri Sembilan and Selangor, all of which will be divided into 4 zones. The campaign involves organizing half-day workshops in every state for approximately 100 participants. The workshop will provide information on domestic violence and its effects and causes, legal rights and aid provision by Legal Information Clinic in collaboration with the State Legal Aid Centres & NGOs, the impact that it has on Muslim women and also recruitment of participants who are interested to be Advocators. KL SOGO and Carol Lee are hoping that many will come to know of this cause and join in to give their support to AWAM in order to help those who have been or are victims of domestic violence. For more information, kindly contact AWAM at 03 – 7877 4221. And by the way, do remember to join in to vote for Mrs. Malaysia Universe, who was the one who initiated the CSR programme. *You guys can vote for her up to 5 times with a valid email address. Do check out noscara page too. If you vote at the noscara page (http://www.noscara.com/mrsuniverse/mrs-malaysia) and submit the details by 31 July, you might stand to win a VVIP Ticket to Opus Jay World Tour on 3 August 2013! So, remember to check it out!